Happy End of Summer! It is basically fall in my opinion. I mean I finally broke out all my pumpkin decor the other day and with a complete "bite me summer" attitude I raised the pumpkin decor with pride and joy! As we all know, the end of the summer means end of gardens. Boo! But those last few tomatoes, the last few of this and that all needs used up. Waste not, want not, right?! This recipe is perfect for those little tomatoes you don't want to bother canning. Use these for a party, for a side dish, or little snacks for anything! Enjoy this easy recipe ad if you feel so inclined, make your own ricotta cheese using my recipe here! This recipe will actually make 12-16 individual tomatoes. Combine all ingredients except milk. 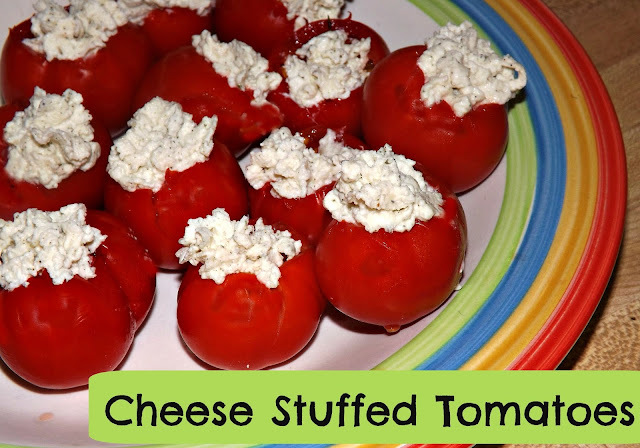 Add just enough milk to make filling the tomatoes easy. Set aside. Prepare your tomatoes by cutting a whole out of the middle. Do not let it go clear to the bottom or your filling will run out. If you want to use a clean finger or thumb an widen the area to be filled with cheese feel free. Feel free to sprinkle some basil, red paper flakes, or salt on top before serving!